We provide full and part-time care for children aged 4 months to 12 years. Based on your child's development and age, we offer different programs to meet their physical, cognitive, emotional, social, and intellectual needs. If you are new and wish to learn more about what Education Hill Learning Center has to offer for your child, read on to see the kinds of programs we have to offer here. Also take a look at some of our parent reviews. • A safe and soft environment to explore and develop bodily skills, your baby can roll and pull, creep and crawl, and even try to walk. • A caring teacher to talk to your babies through gentle conversations, hugs, finger plays, singing, and reading. • A caring community to help your babies build relationships that foster a sense of security and trust. • A experienced teacher who truely loves your babies, and satisfies your baby's needs. Education Hill Learning Center provides your toddlers a safe and nurturing environment filled with fun activities that excite them and give them the comfort and confidence to speak and talk to their friends. 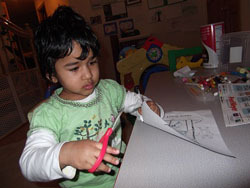 Toddlers become independent, thus, we support their desires to learn to feed themselves and foster self-help skills. as well as make their first friends. Group games provide your toddler with a sense of identity and teach your toddler how to make friends and deal with hassle. • Physical: Your tottler learns to walk, run, jump, kick, toss, draw, write, tie, and even sing. • Social: Imitate what you are speaking and doing, identify and name familiar objects and follow simple directions, as well as playing with peers. • Emtional: Develop strong listening skills through storytelling, learn to express their emotions in a calm way. • Intellectual: Respond their own name, recognize colors, and learn cause and effect through trial and error. 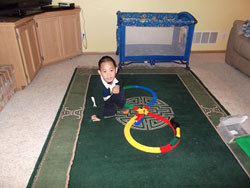 As preschoolers gain more independence, they feel like masters of the world. Our preschool program offers a rich variety of projects and activities that help children become problem solvers and lifelong learners and develop advanced language ability, mathematical reasoning, and scientific thought. • Physical: Your preschooler will learn to run, jump, throw, cut, paste, balance, and coordinate. • Social: Cooperate as a group and help in the classroom with watering plants or setting up snacks. • Emtional: Gain confidence from success and expand their horizons by trying new things. 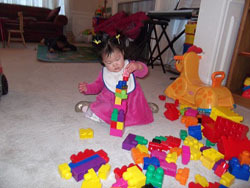 • Intellectual: Identify numbers, count, recognize and write letters and words, and participate in read-aloud exercises. Our kindergarten programs realize that they will soon be entering school. Education Hill Learning Center provides a comprehensive, learning-centered kindergarten program that challenges children and supports all areas of development, and make children easy to enter first grade with the skills and knowledge they need. • Physical: Can skip, walk on tiptoes and jump forward, throw a ball overhand, dress and undress without supervision. • Social: Collaborate with classmates, participate in group discussions, understand games rules, and engage in make-believe and dress-up play in which your child may assume a specific role (i.e. "mommy or daddy"). • Emtional: Discuss shared experiences and gain a sense of accomplishment and pride. • Intellectual: Can state his or her age, tell a simple story, know his or her own phone number, address and several nursery rhymes. Can name four or five colors, can draw a person with a head, body, arms and legs, can understand right and wrong, fair and unfair.